The adult team, composed of Ilona Kupp-Lieck, Olivier Girard et Jean-François Esnault, won the title of Champions of the France Open Paddock Polo 3 !!! For their first participation ! Saturday 6th and Sunday 7th September : A Médoc Polo Club team composed of Ilona Kupp-Lieck, Olivier Girard and Jérôme Houssait-Young participated in the Doyac Tournament, where we came 5th. Saturday 27th and Sunday 28th September : A team from Médoc Polo Club participated in the Autumn Tournament at Biarritz, composed of Jean-François Esnault, Olivier Girard et Jérôme Houssait-Young, and we came 2nd. 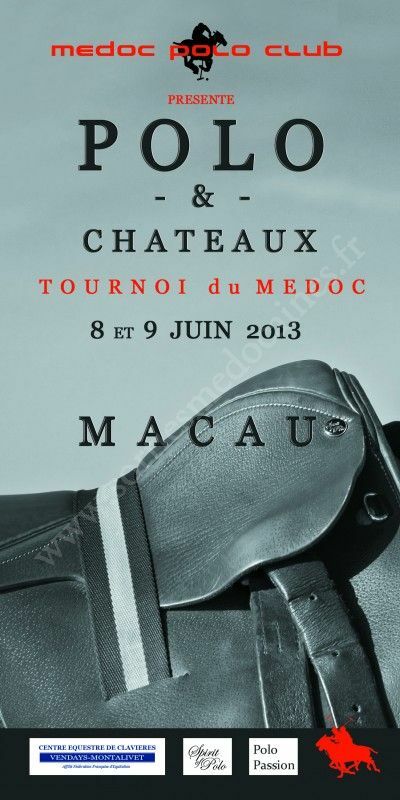 The Medoc Polo Club Tournament on 8th and 9th of June 2013. We played in the South-West Polo Challenge 2013 held in Toulouse, Biarritz, Mont-de-Marsan and Agen. In 2012 we played in Toulouse, Biarritz, Benquet- Mont-de Marsan and Vendays-Montalivet. We also have a « junior » polo team (8 to 12 years old) who will play in the Chantilly tournament on 7th of April 2013! We did not play the 3rd tournament of the South-West Challenge planned for Andas on 4th and 5th September. We still finished third along with Auch, out of the 10 teams entered for the South-West Challenge 2011! We played in the 2nd tournament of the South-West Challenge, the Miramar Cup in Biarritz 9/10 July. We came 6th out of 8 teams. Players of the Chateau Doyac - Medoc Polo Club team: Sacha Chaban, Max de Pourtalès and Jérôme Houssait-Young. We played in the 1st tournament of the South-West Challenge in Toulouse 25/26 June. We came 4th out of 8 teams, for our first match together. Players of the Chateau Doyac - Medoc Polo Club team: Isabelle Rivet, Max de Pourtalès, Jérôme Houssait-Young.